“I started having anxiety problems as a teenager. I tried medication and it made me a crazy person, so I got off the medication. I was looking for ways to deal with my anxiety. It was crippling, I couldn’t be around people at all. And then I learned about meditation,” replied Daniel Scharpenburg when I asked how he found Buddhism. Daniel speaks deliberately. As I listen back to the recording of our interview, I’m surprised to find it’s only a little over thirty minutes and about a third of it is silence. There are long pauses between my questions and his answers, they are intentional and verging on awkward. And yet, they speak volumes. I’m curious, was it not enough to meditate? Why bring Buddhism into it? He pauses for what seems like an eternity. “I guess I wanted context. I wanted history and stories about meditation,” he says. He tells me his practice is not based on ritual and it’s not particularly devotional. He explains that while he can learn a lot by sitting on the cushion, there is so much to learn off it, too. The image of a person sitting alone on a mountain top or sandy beach, cross-legged, hands resting on knees and eyes closed; that’s what we tend to associate with meditation. But for Daniel, having a meditation community was essential. “I was the only Buddhist I knew and I was alone and I wanted to meet great people,” he tells me. He wasn’t sure at first that the Rime Center would be the place for him, being that it is a Vajrayana center which to him meant chanting, bowing and praying, and he wasn’t interested in that. Once he started attending, he realized it was not as ritualistic as he had thought and he stuck around. “We have lots of good visiting teachers that come through and I really value that because they come from all sorts of Buddhist traditions. I’ve met all sorts of people that I could never have met on my own,” he says. But he didn’t just stick around, he soon became an essential part of the Rime Center’s community. 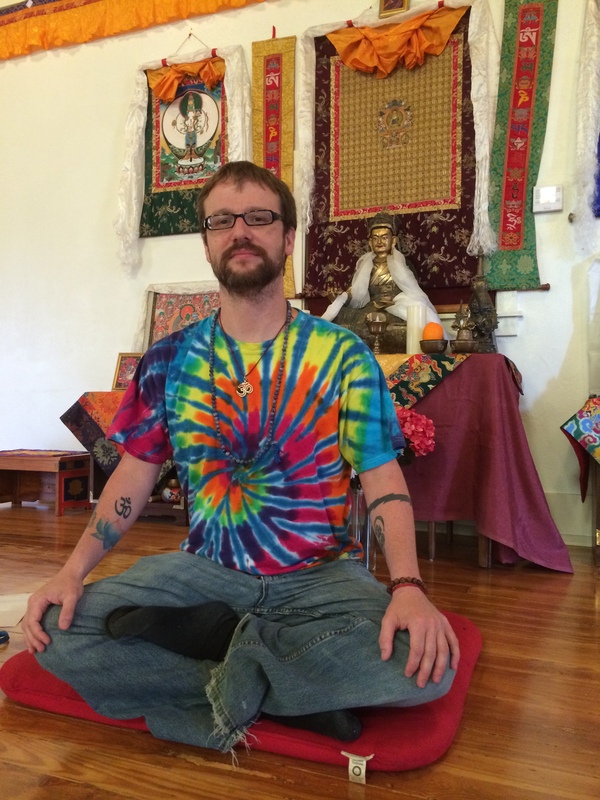 For a few years now, Daniel has been in charge of the center’s Dharma School. Children ages four and up gather in the upper room of the Center every Sunday morning while their parents congregate in the shrine room below. This is where our conversation is taking place, a large, sun-bathed room with exposed brick walls and hardwood floors. In just under an hour, children (including his daughter and son) will start filing in. Personally, I can’t imagine anything more anxiety-inducing than being responsible for a group of children. You’d have to pay me a lot of money to do this and he does it as a volunteer, week after week. He laughs when I ask how he does it. I realize I heard nothing after the part when he said children can only meditate about six minutes. WHAT?! It took me forever to get to five minutes, is he serious? At the time of our interview, that was exactly what I needed to hear. Now, a few weeks later, I find I needed to hear that even more. One more thing… Be sure to check out Daniel’s blog here and learn more about his meditation group here. This is an interview I did for Stories of Devotion.